It's just the greatest thing since sliced bread is what it is. It's a mobile 35mm cinema (not video projection!) 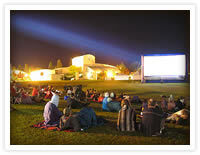 that can travel to any location in NZ, set up within a few hours and start showing movies. The screen is a state-of-the-art airscreen that is a mammoth 50ft! By screening outdoors it means we can utilise the environment in such a way that it adds to the overall experience of watching a movie. 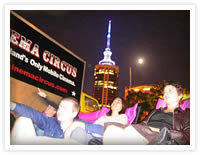 Whether by the sea under a full moon, or at a drive-in with BBQ - the Cinema Circus is flexible enough to bring your favourite movies to just about any location. Cinema Circus is being run by the same folks behind That's Incredible Cinema, so you know you're in safe hands (sort of). On this site you'll find all the information you need to keep up to date with what's going on in our cinematic world. The Cinema Circus usually only operates in the months of Jan/Feb/Mar but you never know when we might be screening, so check back here regularly or join the mailing list. Cinema Circus is a way of looking at movies in a whole new light. With the much appreciated help of our main sponsor V we are able to bring to the New Zealand public the best in big screen entertainment. Please bookmark this site and come back as often as possible to check what's on. There might be additional shows, cancellations, acts of god and who knows what else. The free events are 'koha' based, meaning we'd love a small donation from attendees to keep the circus folk happy and well fed. Any questions, don't hesitate to drop us a line and ask. 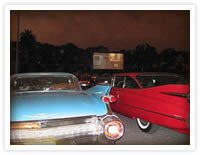 We believe outdoor movies should be just that. In the great outdoors, away from the concrete and noisy bars. Plans are afoot for many theme events in the future. Like our friends at ROLLING ROADSHOW in the US who do this all the time, we hope to bring you their signature events like THE ULTIMATE JAWS EXPERIENCE and the infamous DELIVERANCE event where you canoe down a river, get fed roast pig and then watch Ned Beatty squeal like a pig on the big screen.